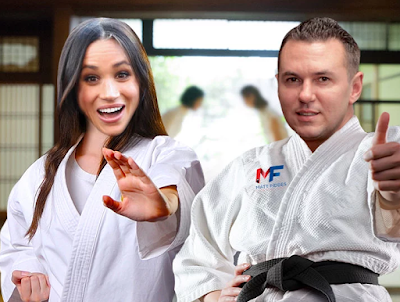 Ahead of her Royal wedding to Prince Harry, bride-to-be Meghan Markle, will be learning some Karate skills, and has reportedly hired Michael Jackson's former bodyguard to learn how to defend herself. According to TMZ, Matt Fiddes, a celebrity security adviser and trainer, who was a former bodyguard to late Pop king Michael Jackson, will teach the Suits actress martial arts and self-defense ahead of her wedding in May 2018. Our Royal sources tell us Meghan has hired celeb security adviser and trainer Matt Fiddes to teach her martial arts and self-defense -- as well as to get her in shape ahead of her wedding with Prince Harry in May. Meghan just landed back in L.A. Wednesday to spend time with her mom ahead of the holidays -- and we're told Matt booked a last-minute flight to Hollywood this week, so the training could begin STAT. Matt's a natural fit for Meghan. He owns one of the biggest martial arts franchises in the world -- Matt Fiddes Martial Arts and works with tons of celebs, including Tom Cruise. He's also got close ties with the Royal Family MJ was tight with Princess Diana, and he became part of her inner circle. Plus he's a Brit, so he'll be geographically desirable. We're told Meghan's endgame is not about fitness -- sources close to Matt tell us Meghan hired him specifically to learn self-defense. Sounds like she's supplementing her hostage training.